Whether at sea, on land, in the air or in space, guardians are distinguished by their selfless service to others, bravery and passion. Let the guardians in your life know that their uncompromising service and dedication will never be forgotten with our customizable Coast Guard 3-Coin Velvet Box. 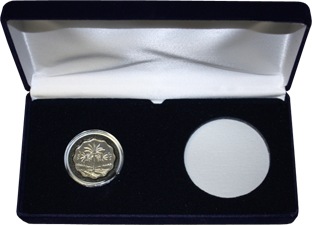 Your gift comes complete with our Products for Good story and certificate of authenticity and includes a liberated Iraqi coin, a Coast Guard Service Coin and a commemorative coin of your choosing. Honor the guardians in your life with our customizable 4-Coin Coast Guard Shadowbox. Your gift includes an Air Force Service Coin, a commemorative coin of your choosing and two liberated Iraqi coins housed in a beautiful 9" x 20" glass-encased wooden frame. Honor the guardian in your life with our customizable Coast Guard 3-Coin Velvet Box. Your gift includes a liberated Iraqi coin, a Coast Guard Service Coin and a commemorative coin of your choosing.